What your best-selling product or service is? Which customer buys it most often? Which region it sells best in? But are you thinking about how all this impacts your future strategy? Most companies spend so much of their time just compiling their data into vaguely readable reports that they end up spending barely any time analysing them. As you know, the real value of reporting lies in the analysis and insights that provide you with a deeper understanding of your business, which ultimately allows you to make better decisions. This is where graphical reporting tools come in. Software that can easily convert your operational and sales data into comprehensive, easy-to-understand, and accurate representations of your data allow you to spend time on what really matters – drawing the insights. So when it comes down to decision-making time, you aren’t just playing a guessing game, you’ve got the data and the reports to back you up. 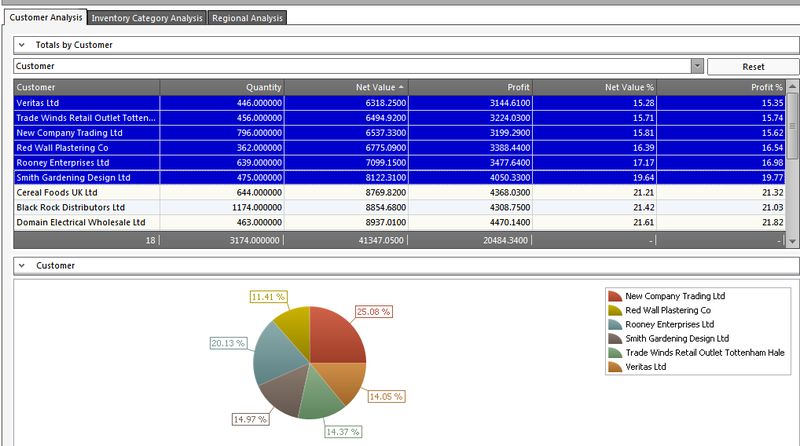 So what should good graphical business reporting tools help you do? Most people hate trawling through rows of numbers trying to make sense of their data. The right business reporting tools will be able to easily convey complicated information to you and your staff through descriptive graphs and charts, and easily facilitate your decision making process as a result. So if you’re wondering how your sales team is performing, or where you need to be dedicating more marketing resources to – your software should be able to show you instantly. This report generated by HARMONiQ’s Control Desk shows the breakdown of sales of your top-performing product categories, so you can instantly tell what’s performing well – and what’s not. Information in isolation often doesn’t deliver anything insightful. Good reporting covers all aspects of your business, including Operations, Inventory, Financials, Sales and Marketing. Businesses often request reports from each department, and then have to figure out how they work together, but this is usually time-consuming and labour intensive. To overcome this issue, look for a reporting tool that will seamlessly integrate all your business systems and compile this information to create reports with company-wide visibility. The most attractive business opportunities usually don’t give you enough time to ponder over pages and pages of reports. Sometimes you just need to quickly access some data to be able to make an informed decision on the fly. 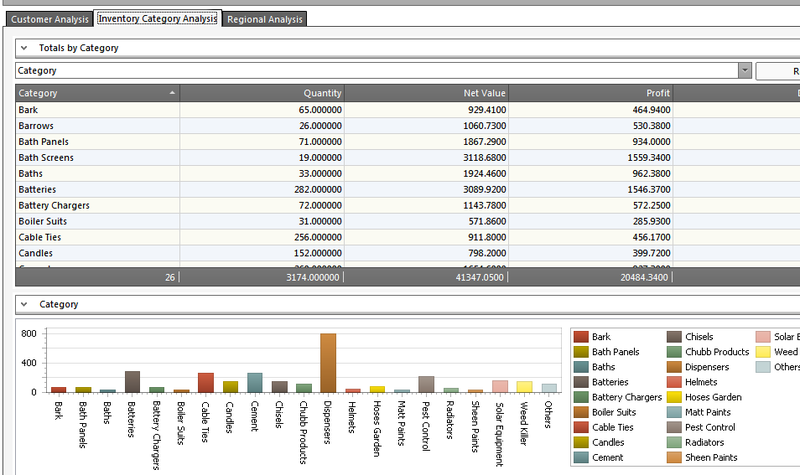 The Sales Analysis Dashboard below highlights the top six customers by net sales value. Now, most managers would put their top sales reps on these accounts. I, however, would argue that that would be a waste of talent and opportunities. Instead, you could be using this report to determine your next best customers, and dedicate your most senior sales resources to ‘up-sell’ and ‘nurture’ these customers to same level as your best performing ones. 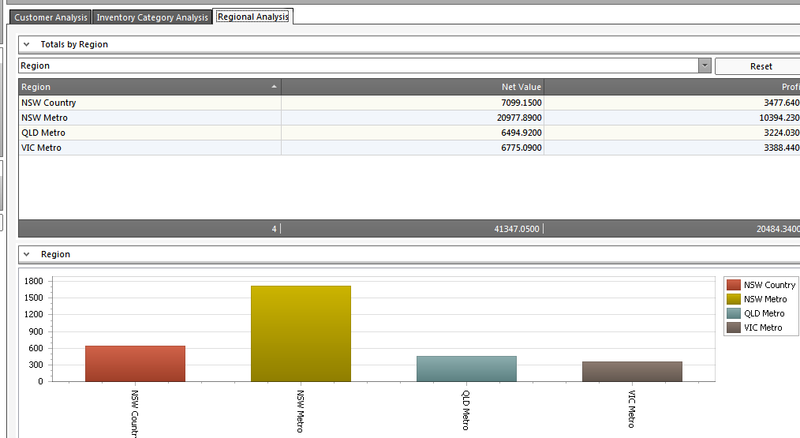 HARMONiQ’s Sales Analysis Dashboard shows the breakdown of your customers by net sales value, highlighting the top six. Use this report to determine your ‘next best’ customers with the intent of nurturing them to generate as many sales as your top-performing clients. Now with the click of a button, this report can change to show me what products my customers are buying. A report like this would be valuble in quickly determining what you should stock, how much, and when you need it by. It could even transform your entire selling strategy – giving you the clarity you need to specialise in your best-selling product categories, or challenging the viability of others. HARMONiQ quickly drills down the report to show specific products your customers purchase, allowing you to make strategic decisions about what to stock and when. With the Regional Analysis report, I can quickly show myself a breakdown of sales by geographic location – instantly showing me which areas I’m the most profitable in, and which places could use a little more love. This can help inform key decisions about the viability of office locations, whether you should consider opening new branches, and where you should be dedicating extra sales resources to. HARMONiQ’s Regional Analysis can easily show me how sales are doing across various geographic locations and inform decisions around hiring and resources. With the click of a few buttons you can easily determine what you should be selling, to whom and where – with the data to back up your decisions. What’s more, you don’t have to scroll through lines and lines of numbers to figure it out. 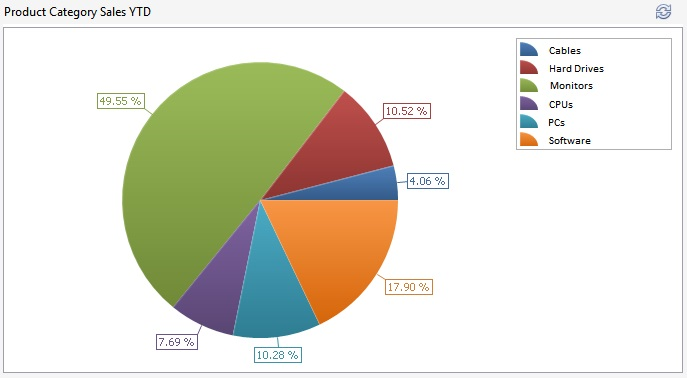 It seems that every business management software can do some sort of high-level reporting. But where things get really interesting – and valuable to your business – is when your software can provide the detail and clarity you need to make key strategic decisions for your business. If this level of insight seems exciting – I can assure you, it never gets old! There is actually a lot more HARMONiQ is capable of, and I would love to be able to show you. If you’d like to see how HARMONiQ can drill down these reports to deliver even more gems of insight let me know below and in 15 minutes I’ll show you what HARMONiQ can achieve for your business. You can also call me on 0412 421 350 or email me on drew@harmoniq.com.au if you’d like to get in touch. Drew Arthur is the Managing Director of Micronet Systems, and is focused on helping business leaders overcome inefficient sales, inventory and customer relationship management practices by leveraging cutting edge technology. If you want to gain better control of the sales processes in your business.